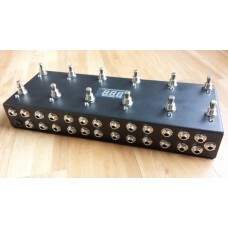 The Programmable MIDI 12 Looper allows 12 loops to be switched at the same time as sending out MIDI commands. 100 Presets are available! Allowing you to save 100 different combinations of pedals and MIDI commands. Control 3 separate MIDI pedals per preset, all on different MIDI channels. The 3 digit display indicates the bank and preset that the pedal is in. Ability to send 3 different MIDI commands per preset (The MIDI channel of each one can be programmed). 3 digit display for programming and to display active bank and preset. The LEDs can be set to display either the active preset or the active loops. Each preset can send up to 3 MIDI commands, which can either be Program Change Commands (PC) or Control Change commands (CC). The number of each type of command that is sent can be selected, for example, 3 PC commands could be sent, or 1 PC command and 2 CC commands. The individual MIDI Channel that each command is sent on can be programmed. The MIDI output can also be disabled if you want to use the pedal as a standard Programmable 12 Looper. 100 Presets are available, arranged in 10 banks of 10 presets. Switches 1 and 2 (the right two switches) are for changing banks. 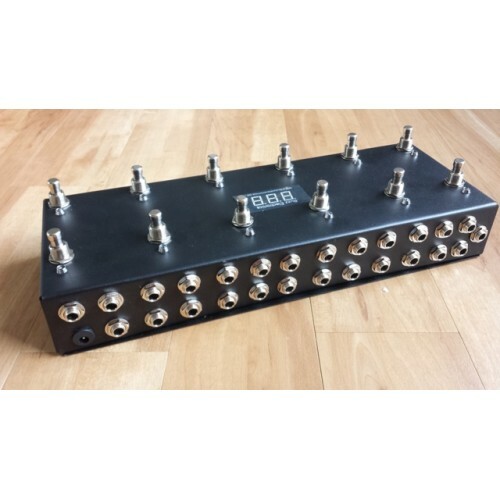 The pedal can also be put into single bank mode, where all 12 switches are used for accessing presets. Each switch can either be set to Programmable or On/Off mode. In programmable mode, the previously active switches disengage when a new switch is pressed. In On/Off mode, the previously active switches stay on when a new switch is pressed, allowing you to add to existing effects. Holding a switch down for longer than 5 seconds will toggle between modes - the corresponding switch will flash 8 times to indicate the mode has been changed. Selecting the FX Loop option above allows some of the loops to be routed through the FX Loop in your amp. This option adds two extra sockets to the pedal allowing it to be connected to the FX Loop Send and FX Loop Receive sockets on your amp.